When my daughter Rachel was about three or four, I jotted down some of the adorable phrases and words that I loved to hear her say. “Tears” were called “cwy dwips” (cry drips), and a “suitcase” was a “cuse box.” Her word for “strawberries” was “STA-biddies” which I still remember her saying, her whispy blond hair blowing around her as she bit into the ripe fruit, grinning while sweet red juices rolled down her chin. Well, “sta-biddies” are in abundance now, and on sale today! 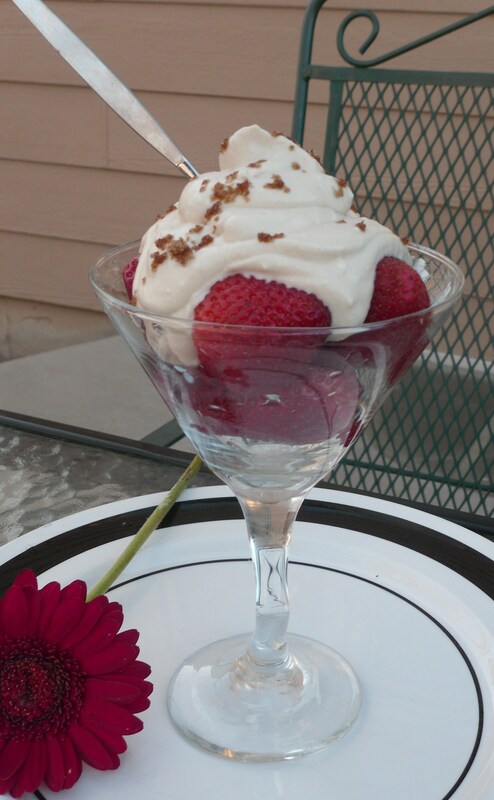 When I saw them overflowing the grocery display, my mind drifted to Strawberries Romanoff, a delectable concoction of strawberries served under a creamy fluff of brown-sugar cream, spiked with brandy, rum or bourbon. I first tasted this summer dream treat at La Madeleines, a wonderful French cafe, popular in the Dallas-Ft. Worth area. Whenever I visit Rachel in Texas, we do our best to go to lunch at La Madeleines and I always order Strawberries Romanoff for dessert. 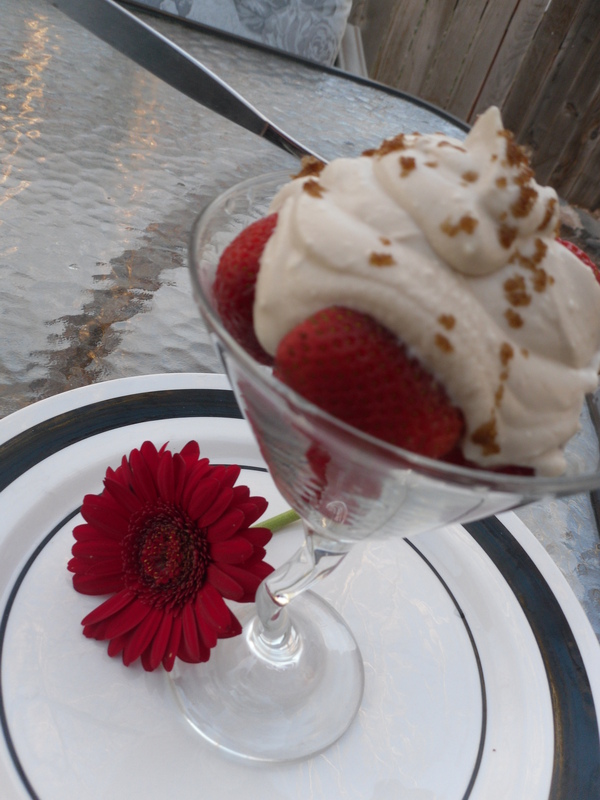 Last summer, when my mom was visiting Denver, I tweaked and combined a few recipes I found online and produced this version of Romanoff cream which we like even better than the dish from La Madeleines! Mom and I sat around the kitchen counter and licked the bowl completely clean! It only takes about five minutes to make the sauce, making this an easy, refreshing and beautiful dessert for these long Spring and Summer evenings. It looks oh so elegant, too. In a medium mixing bowl, whip cream into soft peaks, slowly adding powdered sugar to the whipped mixture. In a separate smaller bowl, whisk together Greek Yogurt, 1/3 c. brown sugar and bourbon. Add yogurt mixture to whipped cream and fold in until well combined. To serve, spoon strawberries into martini glasses, about 2/3 full, place generous dollop (about 1/3 c.) of Romanoff sauce over top of each. Sprinkle a little bit of brown sugar over the sauce for garnish. Variations: You can also layer the strawberries and sauce in parfait like fashion. Big wine glasses, or pretty bowls can also work in place of martini glasses. The powdered sugar helps the cream hold its shape so that it will keep for a couple of days in a sealed container. One of the reasons I always used powdered sugar instead of granulated when I make whipped cream. Veganize This: Try coconut milk “whipped cream” and any of the many varieties of plain non-dairy yogurt.